This video made its way around the Internet juggle-sphere recently, sparking interest in combination tricks. 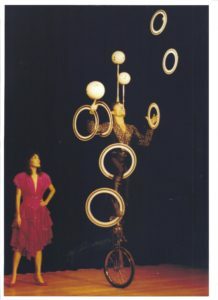 Combination tricks are an “old school” form of juggling where you do lots of different skills at once. David Cain has written a bit about elements of combination tricks, but there aren’t many resources online about how to actually learn them. Let’s get to it! The mistake that many people make when learning a combination trick is assuming that the trick is one thing – forgetting that it’s really the sum of many different parts. If your goal is to learn to juggle seven balls, do you start working with seven right away or do you begin by learning a three ball cascade? 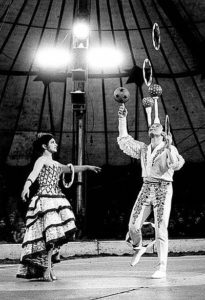 Like all juggling, you need to break combination tricks down into their unique elements and train accordingly. In this article, I’ll explain the simplest process for breaking these tricks down and training appropriately. If you’re a juggler who’s interested in combination tricks, I think it’s a safe bet that you’re looking for tips on learning the Brunn Finish. 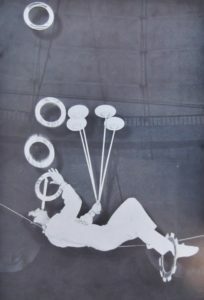 A famous combo where you balance objects on your mouth and forehead, spin a ball on a hand with hoops on the arm, stand on one leg while spinning hoops on the raised leg and ankle, and juggle three rings with your free hand. So – let’s get started. Francis Brunn and his famous “Brunn Finish” in 1969. Via. 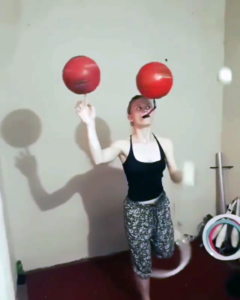 All of the components of this trick are relatively simple, but you will have a much easier time with it if you’re able to balance an object on your face while juggling (which, when you think about it, is also a kind of combination trick!) The split-focus you cultivate by learning that skill is absolutely essential when learning more complicated combinations. If you can’t do that yet, don’t worry! I wrote a blog post about it just for you! A hoop on the leg. A ball spinning on the finger. A ball spinning on a mouthstick. A large hoop means a heavy hoop. A heavy hoop means a slow spin. A slow spin means more control (and less movement of the body.) I’d suggest either making your own hoop out of PEX tubing (found at any hardware store) or using a large juggling ring (like a Play Saturn or large Mr. Babache.) Finding the right size for you is more important than finding the right weight, though, as the size effects the tempo of the spin. You want to find a rhythm between the tempo of the ring spin and the juggle that matches. This is important, as it allows you to match the skills to one another so that you can focus on one thing (juggling=tempo) rather than two (juggling+tempo). If you decide to train the skill like the juggler in our example – with the ankle spin behind the body, it will be very difficult to progress to doing the same trick with a balance. (Notice that the GIF of Francis Brunn earlier on has the leg hoops in front of his body!) Making corrections to a spinning ring behind your body can make you tip your center of gravity forwards – tipping your pelvis and pushing your spine out of alignment with your standing leg – moving into the direction an “arabesque” position. This makes it very difficult to correct any kind of balance. There’s no “right” way to do a combination trick (you’re an artist, after all! ), but just know that it’s very difficult to un-learn habits once you’ve established them. If you have a hard time spinning a ball on your finger, use a spinning plate. If you have a hard time spinning a ball on the mouthstick, use a spinning plate. There’s no shame in doing a different version or modifying a trick you see to make it simpler (and – to make it your own!) If you aspire to do it with a ball later on, great! You’re training the fundamental skills now to make it more complicated later on. If you can’t spin a ball on your finger, check out this video by Niels Duinker. You’ll notice that this is a different technique than what’s in tutorials about spinning a basketball on your finger – those tell you to start the spin with both hands. You’ll have juggling balls in one hand, so you need to be able to spin a ball with just one hand. If you decide that ball spinning is your new favorite thing in the universe, check out Rhys Thomas’ book on the subject. It can be hard to find, but it looks like Serious Juggling has copies in stock at the time of writing. A good spinning ball can be hard to find. David Cain has some tips in this article. Radfactor also makes a pretty decent spinning ball, though it has a bounce that some find offputting. If you want to skip the DIY stuff and just buy a mouthstick, the only real option for you is made by Play. (Americans: these are also sold in the US by Renegade Juggling.) I find their bits to be too narrow for me, though. Your mileage may vary. Enough of that. Let’s get to the good stuff. Dig the article so far? Join Thom’s mailing list and be the first to know about his book release! So now you’ve gotten your props and have mastered the individual skills. Time to start training the actual trick! The easiest way (“easiest” way) to learn a combination trick is by working on all of the component parts of the trick independently, and in smaller combinations with one another. 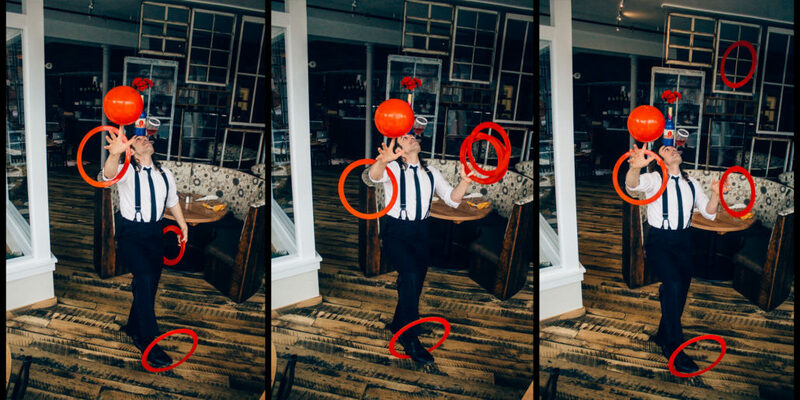 In a four-part trick like the one we’re working with (hoop on the ankle, spin on a mouthstick, spin on a finger, and a juggle), there are six two-part combinations, and four three part combinations. Spin a hoop on your ankle with a ball spinning on a mouthstick. Spin a hoop on your ankle while spinning a ball on your finger. Spin a hoop on your ankle while juggling in your (non-spinning) hand. Spin a ball on a mouthstick while spinning a ball on your finger. Spin a ball on a mouthstick while juggling in your (non-spinning) hand. Spin a ball on your finger while juggling in your (non-spinning) hand. Nota bene – Of course, these are in addition to the “soft skill” of standing on one leg – what allows you to spin the hoop on your free ankle. If you’re adding a balance to the mix, learning to shift your focus is another skill that could be added. If you’re having a hard time with the ankle spin, try training those combinations just by standing on one leg instead of worrying about the hoop. Depending on your aptitude and level of juggling technique, mastering these steps could take you anywhere from a week to several months. Once you do, it’s time to move on to the next step! We’re halfway there now! Time to start training groups of three skills at the same time! Ankle hoop, mouthstick spin, and finger spin. 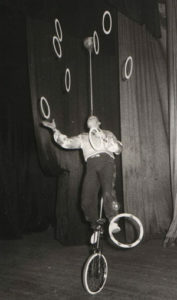 Ankle hoop, mouthstick spin, and juggle. Ankle hoop, finger spin, and juggle. 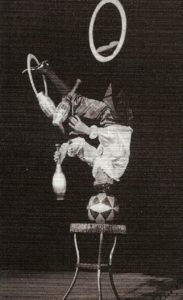 Mouthstick spin, finger spin, and juggle. Rinse, repeat, and take notes about your training. This step is where you’ll start to find weird things that happen. Maybe you always drop at a certain point – when starting a skill or when your focus shifts. Maybe you learn a better way to stand on one leg that helps control the mouthstick spin. Maybe you find a relationship between the ankle hoop’s tempo and when it’s easiest to start the ball spin on your finger. These are all interesting and important things as you move along – reflecting on your training now will make training the full version of the trick easier and more effective. This is the final step! All of the pieces of the puzzle should be about ready to interlock. The only thing you need to do now is practice it all – including your setup and dismount from the trick. You may find an order that works better for you, but the idea behind this sequencing is that you isolate your body in space, making sure that you have a solid place to build from. If you have the balls spinning on your finger and mouthstick, you’ll have a hard time reaching to start the hoop on your ankle. If you have a solid ankle spin, though, you can start from there and build the trick without having to bend your body, lose your balance, or drop an object. As you progress with your training, you’ll find that you focus on one aspect of the trick with your conscious mind and let your “lizard brain” do the rest of the trick. In the example video, you’ll notice that the juggler is watching the juggling balls the entire time. 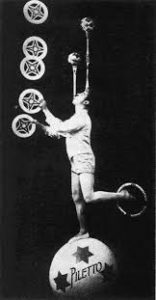 If you see photos of Francis Brunn executing his finale trick, you’ll notice that his eyes are usually on the juggling rings. Find what works for you by experimenting with different points of focus. And… there you are! A combination trick master! Once you learn your first combo, you’ll lay awake at night asking yourself “Now, if only there were a way to make it harder….” But that’s half the fun! The sky’s the limit with combinations – if you train one, send me an email with a video! I always love to see what my juggling friends are working on.